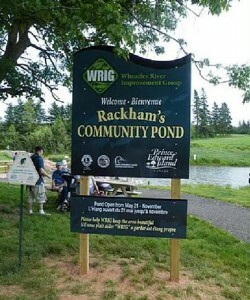 Wheatley River Improvement Group | A watershed group in PEI, Canada. Welcome to the home of Wheatley River Improvement Group, a non-government, not-for-profit organization dedicated to protection and management of The Wheatley River, Cymbria, Chapel Creek, Oyster Bed Bridge, Hornes Creek and Luke’s Creek Watersheds. The Wheatley River Improvement Group published a note. April 2019 UpdateHappy April! spring has sprung, and it is defiantly a welcome sight here at WRIG. Things are starting to get going after this long winter, gearing up for the upcoming summer field season. To start things off WRIG’s Annual General Meeting (AGM) is coming up! The AGM will take place on Wednesday April 17th beginning at 7:00pm and will be held at the Wheatley River Community Hall, located at 16 Rackham’s Lane, Wheatley River. The guest speaker for the evening will be Kate MacQuarrie, Director of Forest, Fish and Wildlife of Communities Land and Environment. Kate will speak about one of the major funding programs that help many watershed groups across the province do the great work that we do, along with some of the projects it has helped accomplish. A brief business meeting will follow, and refreshments will be served. All are welcome, we hope to see you there! Over the past two months several waterfowl traps were set in the WRIG watershed. These traps were set by local hunters Geoff Wood and Arnold MacLean, volunteering to band resident ducks for the Canadian Wildlife Service. The ducks were outfitted with metal bands placed on their legs, with a unique code specific for that individual. With this information the Canadian Wildlife Service can monitor migration routes, population status, fitness and age of the individual. WRIG was lucky enough to join in the banding process, all together there was 86 ducks banded between two different species, Mallard and American Black Duck. If you are interested in becoming a WRIG member you can do so at our AGM, by mailing in the membership form found on our website (www.wheatleyriver.ca), or by contacting us directly by email at manager@wheatleyriver.ca. A family/individual membership costs $10.00 and helps us to continue our work restoring streams, planting trees, and contributing to the overall goal of improving the health of our watershed. As a community environmental group, we rely on the support of our members and volunteers to make the work we do possible. Your support is truly appreciated! We are looking forward to the 2019 field season, and welcome any interested volunteers, who would like to get involved. Also keep and eye out for WRIG job postings in the coming months! Extensive icy conditions continues to be a problem at our Winter Woodlot Tour site and the weather forecast is not working in our favour for safe site conditions. Searching for Volunteers to Join WRIG’s Board of Directors.WRIG is looking for volunteers who would be interested in joining its Board of Directors. Our goal is to improve and preserve our communities’ natural areas for generations to enjoy, through public events and restoration efforts. The board is made up of members interested in helping achieve this goal. Meetings are held once a month, if you are interested in joining the WRIG Board of Directors contact WRIG through our Facebook page or email us directly. We are looking forward to hearing from you. January 2019 UpdateIt has been a snowy and stormy start to the new year but WRIG is still very excited for what 2019 has in store! The 2019 Winter Woodlot Tour is only 4 weeks away, and the planning committee is hard at work preparing the site for a fun filled day in the snow! Event organizers include WRIG, the Hunter-Clyde Watershed Group, the Central Queens Wildlife Federation and the Department of Communities, Land and Environment. This great family event will be held on Saturday February 9th, 2019 from 9am-1pm at the Strathgartney Equestrian Park (18 Strathgartney Road, Bonshaw, PE). There are great activities lined up and knowledgeable presenters for everyone to enjoy. Activities include sleigh rides, snowshoeing and guided nature walks, watershed and woodlot management booths, chainsaw maintenance clinics, falconry demonstrations, free hot apple cider and much more. 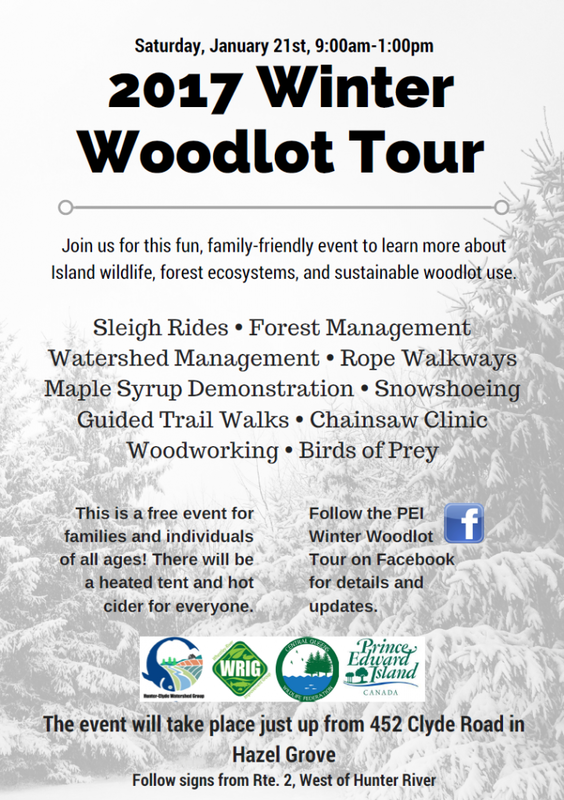 Keep up to date on news about this event on the Winter Woodlot Tour Facebook and Instagram pages (@winterwoodlottour). If you are interested in volunteering at this event contact organizers through the Facebook page or WRIG! The Canadian Wildlife Service waterfowl banding program has 2 banding locations in the Whealtey River Watershed this winter. Waterfowl and other migratory birds are banded to help monitor migration routes to winter and summer destinations. There are 4 major flyways in Canada, the Atlantic flyway, Mississippi flyway, Central flyway and the Pacific flyway. When a banded bird is recovered the number on the band is called in and the caller can receive all the information on that bird, how old it is and where is was banded. There are records of waterfowl form New Zealand and being recovered here in PEI. Tracking waterfowl migration is an important part of their protection and habitat conservation. Please feel free to contact us with any questions, concerns, or observations, we would love to hear from you! Happy New Year from WRIG!